Heaven was in need of a hard-working farmer and there was fieldwork to be done, so Dad accepted the job with a smile. Anthony Peter Laufenberg (Tony), age 94, passed peacefully into the presence of his Savior on Tuesday, February 5, 2019 at Sun Prairie Health Care Center. Tony was born at home on January 3, 1925 in Ashton, the third child of Joseph and Barbara (Miller) Laufenberg. He attended St. Peter’s Catholic School in Ashton through the 8th grade (he did receive an honorary high school diploma from Marshall High School in 2013 when he was 88 of which he was very proud). Instead of high school, he started working on neighboring farms to help out his family. In 1943, he was drafted into the US Army Air Corps and was stationed in the China-Burma-India Theatre. He was a member of the 420th Air Service Engineering Squadron where he was a mechanic/sheet metal worker. He also helped fly supplies to front line troops in Burma and rescue downed flyers who were transporting gas over the Himalayas. He was honorably discharged as a Corporal in 1946. He met Alyce Kalscheur at a dance when he returned and they quickly fell in love. They were married on June 28, 1947 at St. Raphael’s Cathedral, Madison. They were married 69 years until Alyce’s passing on November 13, 2016. Tony was employed by Oscar Mayer, but also farmed in Waunakee for a few years, where they had their first 3 children. In 1951, they found their dream farm in Marshall which was quickly named “Lullaby Acres”. As their farm grew, so did their family, as they welcomed 8 more children. Tony loved Alyce and his large family, especially the grandchildren and great-grandchildren. He loved farming the land, as well as raising a variety of animals and milking Holsteins. His experience as a mechanic in the war served him well on the farm. While his children were young, he attended night school for many years to study agriculture/dairy. He and Alyce traveled all over the world; a favorite trip was to Africa when they turned 70. After retiring from farming, he enjoyed reading, building and flying remote control airplanes, making birdhouses, planting flower beds and trees, stocking fish in his pond and keeping up his beautiful yard. Their home on “Lullaby Lake” was a favorite spot for fun family gatherings. Tony was a member of Holy Family Parish in Marshall for 68+ years. He sang in the church choir for years, was a member of the Catholic Order of Foresters and served on the parish building and finance committees. 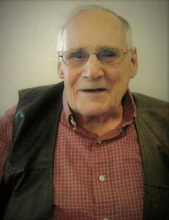 He was a past member of the Box Elder School Board and the Town Board. He was a member of the American Legion Post #279, Marshall/Waterloo VFW Post #6614 and belonged to many farm and dairy organizations thru the years. Tony is survived by his 11 children: Tony (Vicky), Carol (Randy) Zander, Sue Meffert, Tim (Renee), Tom (Theresa), Ted (Bridget), Alice (Dan) Allen, Joyce (Wayne) Knapton, Mary (Steve) Millin, Linda (Todd) Meffert and Todd (Darlene). He will be missed by his 27 grandchildren, 25 great-grandchildren and their families. He is also survived by a brother, Laverne (Karen) and many nieces, nephews, cousins and friends. He was preceded in death by his wife Alyce, his parents, his brothers, Raymond (Ann), Roman (Marie and Dee), and a sister, Dorothy (Joe) Walsh. Also preceding him in death were Alyce’s parents, John (Margaret) Kalscheur, her brothers, Leonard (Helen) and Eugene and her sister, Margaret (Bill) Walsh. Greeting him in heaven also will be two special grandsons, Joe Anderson and Daryn Allen and a special son-in-law, Peter Meffert. A Mass of Christian burial will be held on Tuesday, February 12, 2019 at 11 a.m. at Holy Family Parish in Marshall with Father Jorge Miramontes celebrating. Burial with presentation of Military Honors will be in the parish cemetery. Family and friends may call on Monday, February 11th from 3-7 p.m. at the church and from 10 a.m. until the time of the Mass on Tuesday. Memories and online condolences may be left at watertownwifuneralhome.com. The Hart-Vick Funeral Home of Watertown is assisting the family. Memorials in Tony’s memory may be made to the American Legion Post #279, Badger Honor Flight or the Marshall Scholarship Foundation. Tony’s family would like to thank his second family at Sun Prairie Health Care Center for all the care and love provided to him and his entire family the past few years. We love you and will miss you Dad – give Mom a kiss from us! To send flowers or a remembrance gift to the family of Anthony Peter "Tony" Laufenberg, please visit our Tribute Store. Military Honors will be presented at the parish cemetery following the service. "Email Address" would like to share the life celebration of Anthony Peter "Tony" Laufenberg. Click on the "link" to go to share a favorite memory or leave a condolence message for the family.